Benefits & Advantages •	Get permanent residency in Brazil. •	After 4 years, you can apply for a Brazilian passport and citizenship. •	Brazilian passport holders have the right to travel visa free to 150+ countries. See full list below. •	The Brazilian passport is one of the most sought after in the world ranking 17th on the 2019 Henley Passport Index. a)	Purchase and sale agreement, registered. confirming the funds came in with the property channels authorized by the Central Bank. d)	Incorporation documents registered Note: All documents issued abroad must be legalized with an Appostile and sworn translated to Portuguese in Brazil. Submit your reservation form for the chosen property or properties along with 10% deposit payment. Upon completion you will receive your Purchase Contract. paid over various instalments during the construction period. As soon as payments reach a total of R$700,000 in the account in Brazil, the lawyer can start to process the permanent residency. The lawyers will start the application process upon receipt of 50% of the total fee (R$2,500). The remaining 50% will be payable upon approval in Brasilia. 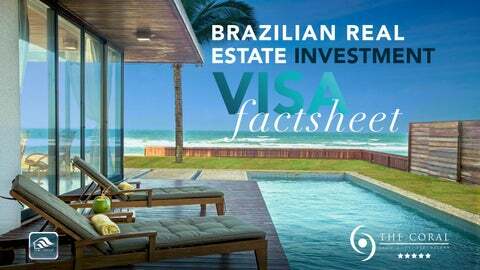 REAL ESTATE INVESTMENT OPTIONS AT THE CORAL BEACH RESORT The Coral beach resort offers approved real estate investment options to obtain your permanent residency and passport in Brazil. From apartments to luxury villas, all investments at the resort come with excellent income earning potential with up to 10%+ rental yields per annum. Owners of luxury villas are already earning income from their investments, with peak season occupancy rates exceeding expectations. you can obtain permanent residency in Brazil and what the best investment options would be for you investing at The Coral beach resort. Disclaimer : The information contained herein is solely for informational purposes and does not constitute an offer by BRIC Group to sell, rent or lease real estate. All information provided is believed to be accurate and correct at the time of publishing and is given in good faith. BRIC Group disclaims any warranties or representation concerning the accuracy, correctness or reliability of the information contained within this document and instructs you to independently verify the accuracy of the information provided. All intellectual property rights are retained by their owners. 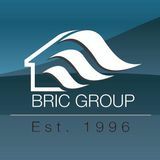 All content including text, images and logos are the proper ty of BRIC Group. It is not permitted without the express prior consent of BRIC Group to transfer, copy, distribute or compile in whole or par t any of the content contained herein. All images used are for illustrative purposes only and may differ from the final product.